switches it back to the microphone automatically. Jan 4, 2007 : FCC issues a violation for improper station identification. Windows XP, Vista, Windows 7 with DirectX 8.0 or higher. Earlier windows versions may work. 16 Bit SoundBlaster compatible sound card (See FAQ). Three different options when to send the CW Identification, including a manual send. Compatible with most commercially manufactured sound card interfaces. See FAQ for setup with the RigBlaster Pro, RigBlaster Plus, RigBlaster Plug and Play, MFJ 1275, and MFJ 1279. Built in controls for the sound card. Selection of sound card independent of preferred sound devices. Saves and remembers all settings including all sound card settings. Restores all sound card settings after use. Simple to interface to your present transceiver. Build your own interface with easily obtainable parts. Support for Com ports 1 to 16. Requires 16 bit SoundBlaster compatible sound card (See FAQ). Check for updated versions with a simple menu choice. RoMac Software's Automatic CW identifier and Tuning Pulser utilizes your present computer's sound card to automatically send your callsign at preset intervals, to insure your stations compliance with FCC regulations. Also incorporated is a Tuning Pulser aka Pecker, to aid in reducing stress and heat while tuning your amplifier, antenna tuner, etc. The program will run in the windows tray so it will not take up valuable screen real estate. also available is an option to display a small time to ID clock anywhere on the screen you want. Select whether to send the CW Id either at the beginning of a transmission or at the end . You can make sure your station is properly identified while tuning up. 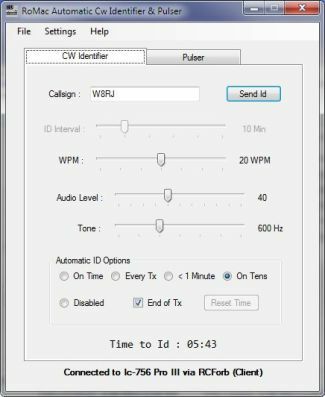 You have the option to send the CW Id at the end tuning with the Pulser. No more forgetting to ID properly! No more programming EPROM's to change callsigns. Just type in your new callsign and you're ready to go. Great for that new vanity call you want in the future. CW speed speed is fully adjustable from 5 to 40 wpm, ID time interval ranges from 1 to 30 minutes in one second increments, and the tone of the CW note is adjustable from 500 Hz to 1000 Hz. Choose from three convenient options of when to send you station identification, to ensure your compliance with the FCC regulations. New Support for CAT commands for many popular radios. Support for even a simple sound card interface such as the RigBlaster Plug and Play in combination with the new CAT support. When using CAT support, the interface to your radio may be as simple as an isolation transformer. See the FAQ for specific issues with the West Mountain RigBlaster Pro. If you don't presently have a sound card interface a complete schematic for a basic yet fully functional interface is included here and in the help files. All parts are available at your local Radio Shack store. All settings are saved from session to session. All sound card settings are restored when quitting the software. Just start the software running and your station is ready to be compliant with the FCC regulations. Any sound card that is installed in your system may now be selected independently from the windows default sound device. The Pulser aka "Pulse Tuner" sends a series of short audio tones with a duty cycle as low as 20% to the audio input of your radio enabling you to tune your amplifier or antenna tuner, without worrying about overheating those expensive amplifier tubes or antenna tuner parts. Take your time, tuning your amplifier optimally using the RoMac Pulser. Considering the cost of replacing amplifier tubes, the RoMac Pulser is a bargain! Some "Tuning Pulsers" merely key your radio using the CW jack on your radio. RoMac Pulser sends a series of short audio tones (pulses) to you microphone input. The pulses are also "shaped", so the amplitude of the pulse slopes up to peak amplitude. This further reduces heat and stress on you expensive amplifier tubes and parts. The RoMac Pulser is compatible with all transmitters, from Icom, Kenwood, TenTec, Yaesu, Collins, Drake and others. Will work with any amplifier on the market today or any older amplifier. The speed and duty cycle of the audio tones are both adjustable. All settings are saved from session to session. The free evaluation software runs for 10 hours of cumulative running time.